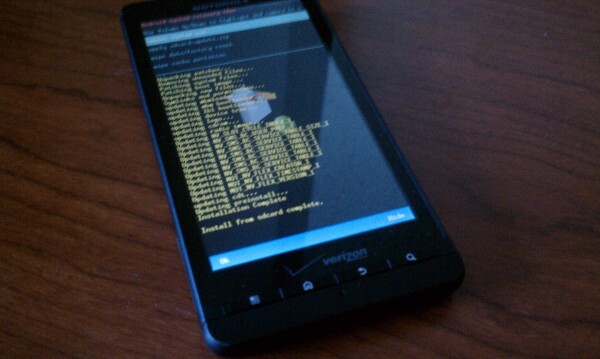 A leaked version of Android 2.2 for the Droid X has popped up this morning and is available for all users to try. It’s a simple “update.zip method” and can be done in just a couple of minutes. This is our first taste of the Froyo for the DX and we’re hoping it fixes the dozens of bugs that have frustrated so many of us. I will say right up front that this is more than likely not the final version and if you update to this version, getting back to stock 2.1 is not going to be easy. Download: MOTOROLA IS REMOVING DOWNLOAD LINKS FOR THIS 2.2 UPDATE LIKE CRAZY. AT THIS TIME I’M GOING TO HOLD OFF FROMM UPLOADING THE FILE. SORRY ALL. *Note 1* – This should work for rooted users as well. Just make sure you haven’t themed or removed any bloatware or it will not work. *Note 2* – If you get an installation aborted error mentioning the “logwrapper” we are looking into the issue and will update you as soon as we know a fix. Update 1: LOGWRAPPER FIX INSTRUCTIONS HERE. *Note 3* – To keep root you must move your “su” file to your xbin folder and out of your bin folder. You can check by going into /system/bin. 3. Boot into recovery but holding the Home key and Power at the same time. 4. When a triangle with exclamation mark appears, release buttons and press the Search key once. 6. Once highlighted, press the camera button to apply the update.zip. 9. You phone should now reboot running Android 2.2. Again, this is a leaked version, so we have no idea if it is final or not. If you update to this, it is not an easy process to get it back to stock 2.1 and requires RSD Lite and an SBF file which I know you all love so much. Do so at your own risk!